Azure is introducing a new recommended pricing tier in the preview portal. The new recommended pricing tier helps you select the right offering by looking at your situation and offering 3 recommended choices. 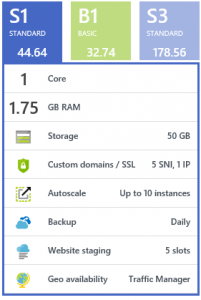 You can still browse all tiers, but this takes some of the guesswork out of Azure pricing.